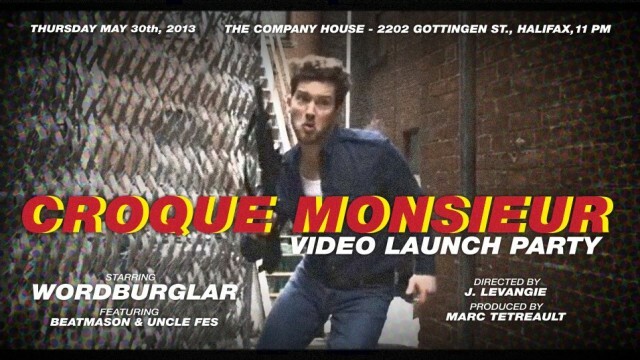 Be one of the first to see Wordburglar’s new video for “Croque Monsieur” when it debuts at the Halifax video launch party on Thursday, May 30 at the Company House (2202 Gottingen St) in Halifax, Nova Scotia. Directed by J. Levangie and produced by Marc Tetreault (the same creative team that brought you “Rhyme O’Clock”) and guest-starring the boom-baptical Beatmason and the crown prince of cuttin’ Uncle Fes, CROQUE MONSIEUR is an action packed homage to the best 80s TV show you’ve never seen. The release party features a live set from Wordburglar at 11:30 pm sharp followed by the video premiere at midnight. Doors open at 11pm. AND THIS SHOW IS FREE.